The next assortments of Angry Birds Transformers toys have begun to turn up at US retail. The “Deceptihogs Revenge” branded releases, which go along with the latest app update, add single packs of Thundercracker, Grey Slam Grimlock and Dark Megatron to the mix. A two pack containing Jazz and Brawl is also now out on shelves. This sighting comes to us care of TFW2005 member Sideswipe1954, who informs us he saw these in the Frederick, MD Toys R Us store. Happy hunting everyone! I never saw any of the first wave at any of the stores in my area, I wonder if I should bother trying to find wave 2 or if it will be less painful to just overpay for Thundercracker online and be done with it. Was thinkin of getting one but not sure what he addiction level will be like. They are sort of pieces of crap, but if you play the game (and I have two boys that do) then they are good for restoring the health of your characters without having to pay up to 600 coins. 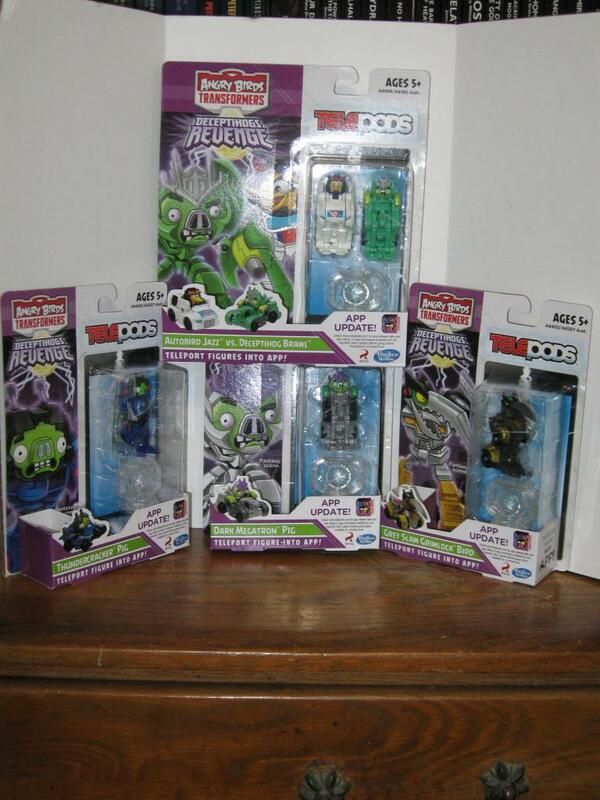 As for toys or figures to have outside of the game… Well, you can buy a crap ton of Bot Shots for a helluva lot cheaper. They are basically the same thing but with the Angry Bird gimmick. I just put these out 2 days ago at the TRU i work at in sunnyvale california….all of them are still there today. ok time for a dumb question – I'm guessing there are no plans for transformable Angry Bird Transformers? EDIT answered my own dumb question. Wow i pay no attention. So they're like what, flipformers? anyone have any pics out of package? Wave one was in my TRU for about 10 days prior to Christmas and haven't seen anything since. Will have to keep my eyes peeled for these. You think they would use some bird/pig transformers for the bird/pig line. Thanks for the heads up on this. Went to TRU and grabbed them today! Wow, that's the most G1-colored Thundercracker toy since the original. the toys are so halfassed it's sad. why is grimlock humanoid? where's jazz's visor? and bludgeon's white face? Kinda too bad the Megatron repaint once again gets the short end of the stick, and Jazz is a remold of Soundwave and doesn't really look like his game model. These things are actually really cute desk toys, so sorry they sometimes seem to miss that proper 'finishing touch'. im kinda pissed i havent seen wave one of these in columbus ohio!